We’ve got what it takes to help you quickly set up to sell events and private tastings, with discounted or free member pricing options. Special dinners, member-only events, or weekly tastings. We make ticket selling easy. 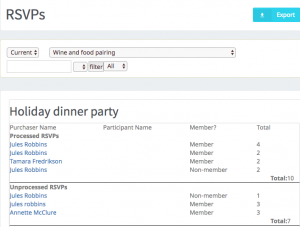 In addition, Vines OS keeps track of RSVP’s and the number of seats sold online, so you don’t have to. Simply select the event, and view all processed and pending ticket sales. At any time you can export your lists to create nametags or manage attendance. When all the tickets have been sold, the event automatically shows as ‘Sold Out’ on the site. 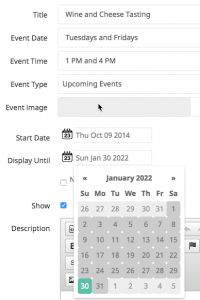 And when the event is over, it will automatically be archived on your web site, so you never have out of date events displaying.